We have on our family holidays to the Outer Hebrides visited Husinis on Harris a number of times. Thanks to the spectacular beach there we’ve never previously ventured beyond it. This year we ventured beyond Husinis and went for a walk around the coast, exploring what I can only assume to be an old and established path to establishments long gone. Our target was the beach at the end of Loch Crabhadail. At the end of Loch Crabhadail, there are some of of the biggest/deepest ridge and furrows (run rigs?) that I’ve ever come across with some 3 feet between the top of the ridge to the bottom. The mind boggles at the effort that must have been put in to eek out a living here and to make the best use of the land. Around the area there are a number of ruins of old shieling like huts, but nothing spectacular or different to anywhere else you’ll see. What is spectacular is the beach – you’re likely to have it to yourself, and that means a pristine sandy beach with clear turquoise all for you. On this visit we didn’t stay long, as there was a bit of weather coming in up the loch that encouraged us to eat our sandwiches quickly and start heading back. But not before taking a quick shot with some fantastic light and a moody cloudy background. 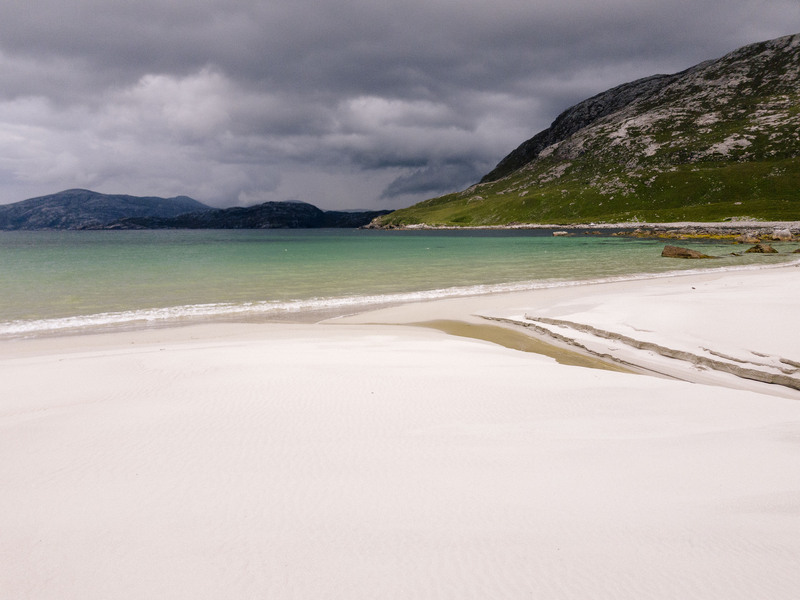 You can see more Seascapes and more from the Outer Hebrides by following the links.